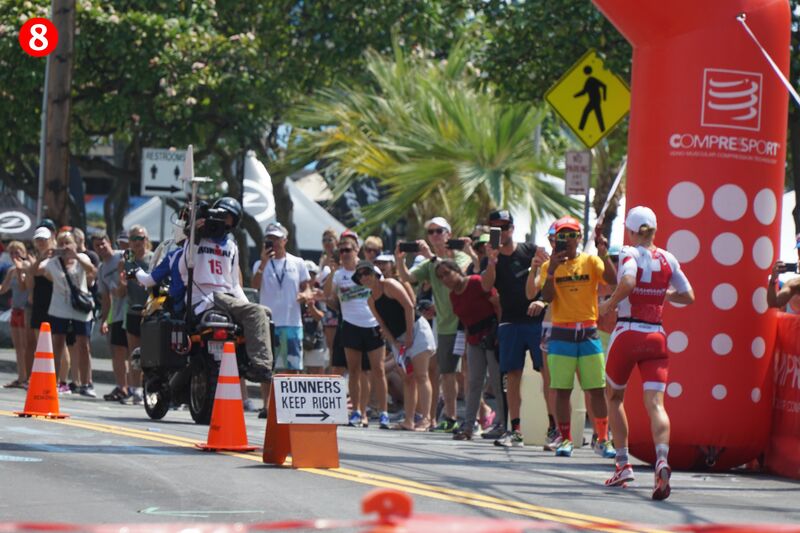 So here’s my spectator Guide to watching and enjoying the Ironman Wold Championships live and in-person . This guide will focus on the best spots to watch, when and where to be , recommended camera/video gear to use, and how to enjoy the day and soak in the event. 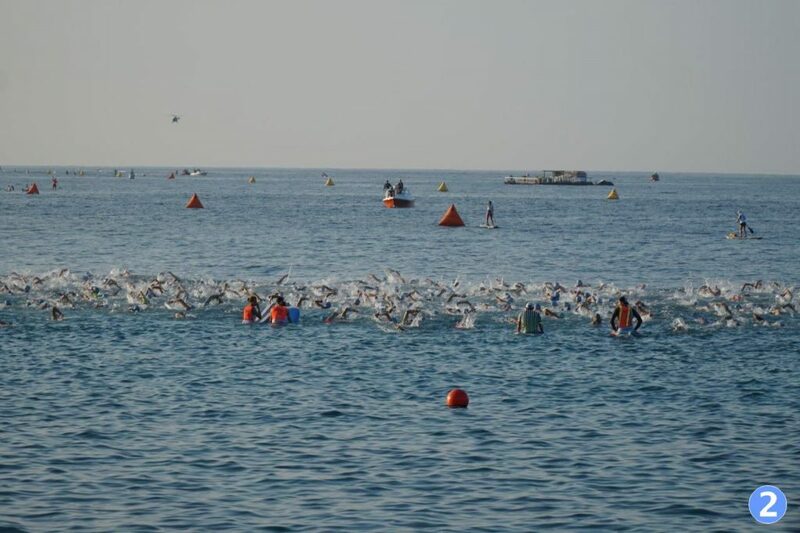 Surprisingly for such a big race it’s pretty spectator friendly, in a nutshell basically anywhere besides the swim start, will offer plenty of unobstructed views of the athletes competing. 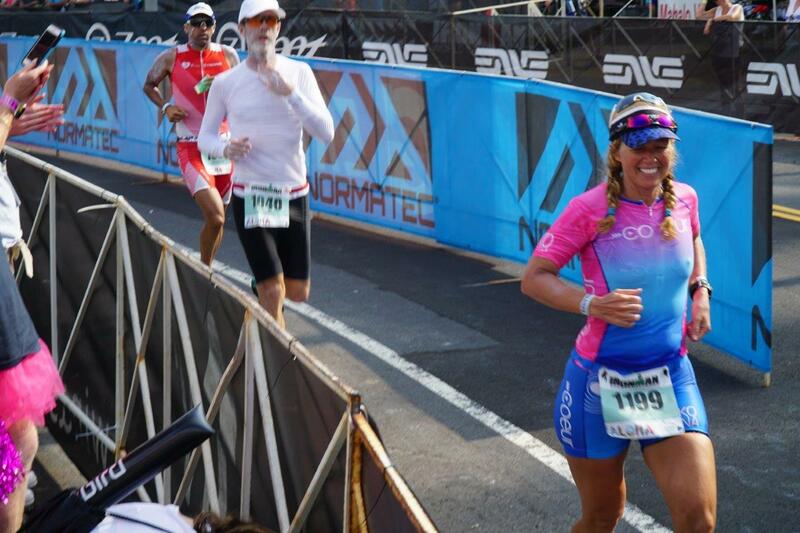 Of course vacationing in Hawaii on the Big Island is a great backdrop for the event, I always wanted to see the Ironman Triathlon live and in-person, and this is the year we decided to do it. Refer to the color-numbers in the Photos and match them to this map to see specific spots where the photos were taken. Ali’i Drive – a few days before the race..
First the excitement and athletes arrive usually a week or two before the race. Usually held on the second Saturday in October, The week before the race, is your opportunity to see all the athletes in their last little bit of preparation, on the beach on the road etc. If you know the pro’s you’ll likely run into them throughout downtown Kona , Ali’i Drive and various other venues as many times, they are at sponsor events in the Ironman village. The main road where the race center’s around is Ali’i Drive. This is where the finish line is and also most of the race activity takes place. The week before the race you’ll find this street a buzz with triathletes getting there last bits of training and race prep in, supporters and tourists visiting the numerous roadside restaurants ,bars and shops , and everyone just enjoying the sunny Kona weather. 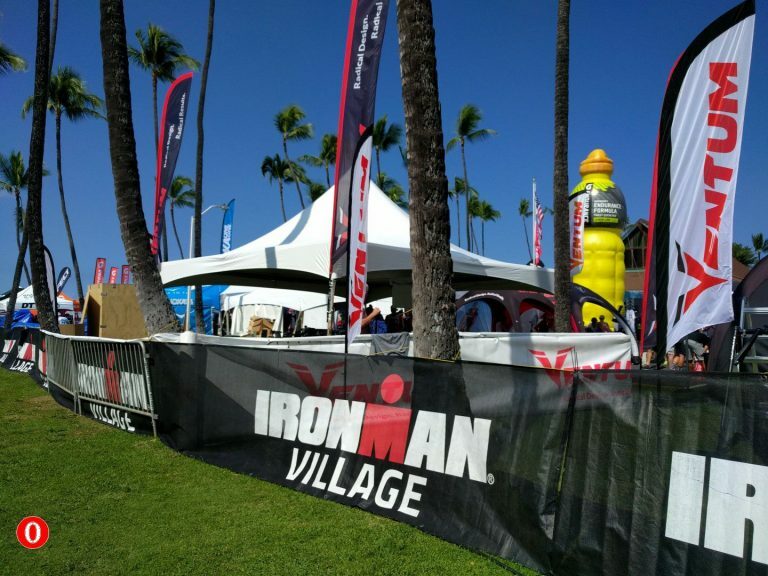 Alongside Ali Drive about a quarter mile before the finish, is the Ironman village, this is the official race expo venue. Here’s where you’ll find all the big corporate brands representing a host of triathlon related gear, from high tech race bikes, running gear and swimming apparel, to tons of nutrition products, recovery products ,performance and more race related apparel and gadgets. Like most race expo’s this is a good opportunity to get some discounts on selected gear, usually you’ll find 10-25% off selected items or your can always ask the vendor for special expo pricing and most will provide some sort of deal. The village is typically opened the week before the race and throughout race weekend. 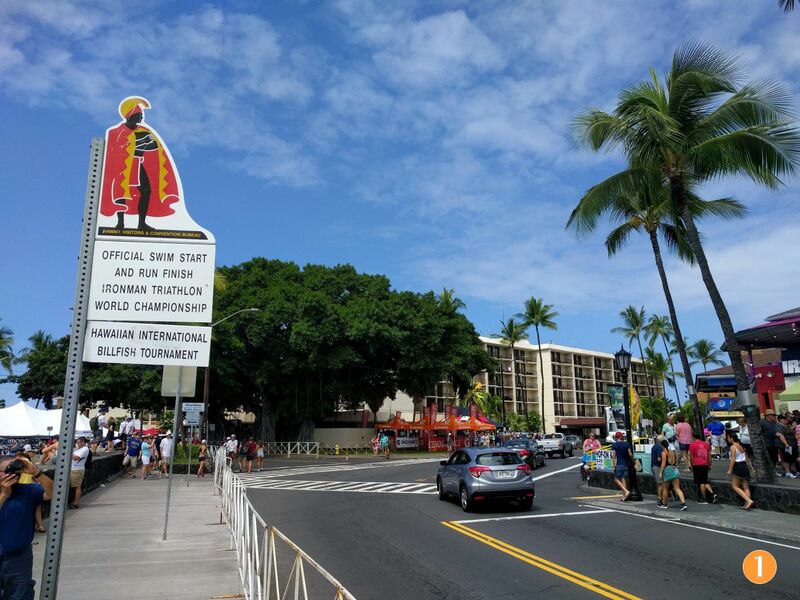 The main hub and the official race hotel venue King Kamehameha’s Kona Beach Hotel . 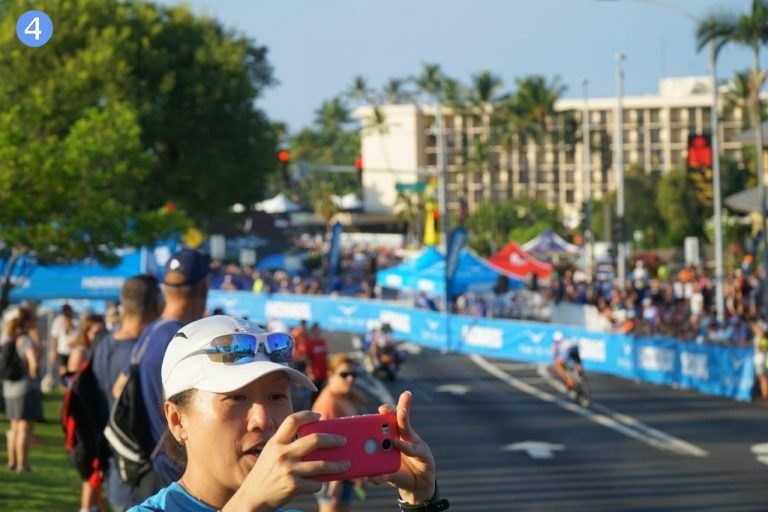 This hotel serves as the principal staging area and main meeting venue for most of the official race activities (athlete meetings, press room, volunteer organization, sponsor events, Ironman shop, etc.,). Right outside the hotels backdoor is the the Kailu Pier which will be transformed into the transition area on race day. Here’s also the start of the swim venue. Yes, the swim course is open every day, you can actually go and swim part of the course as there are buoys laid out to give competing athletes chance to fine tune their swim in Kona’s water. Race morning starts around 4:30 (when Transition opens to athletes), if you get there early you can hang out by the entry to T1 and watch as various pro’s arrive and begin their setup. You can’t totally see their bikes as transition area at the pier is pretty well cordoned off. If you’re driving in , parking can be challenging, since many of the roads which allowed easy access to the area are now closed to traffic for the race. So you’re best bet is to park north of Queen K. Highway. Potential places you can park are the Walmart Shopping center , or Kona Coast Shopping center, or Lanihau Center , or available street parking near these locations. Please obey any signs which may limit parking time since these places are open for regular business during the event. From these areas it’s about a 10 minute walk to the pier. This is arguably the toughest part to watch. For a couple of reasons, most of the area around the pier where the athletes assemble and enter the water is cordoned off. 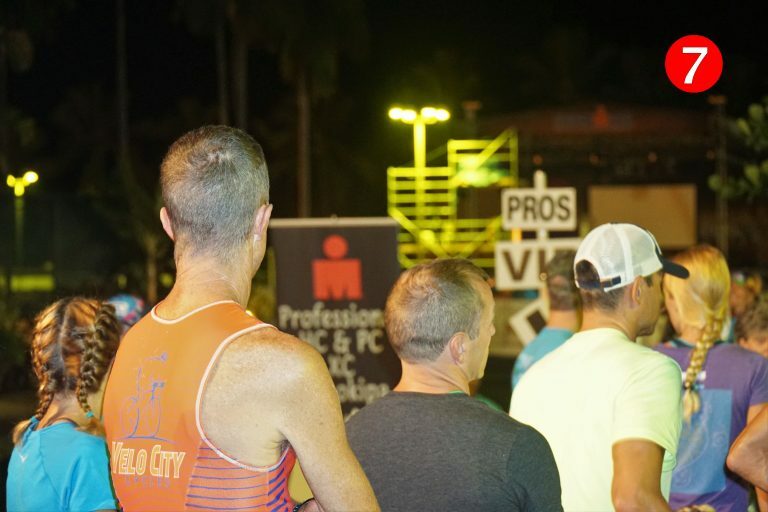 Only athletes, race officials and credentialed media and some VIP’s get up-close access, everyone else is relegated to the sea wall lining the pier and the bay. Also because of terror concerns extra precautions are taken by police and security to block off sensitive areas. Most folks perch themselves of the sea wall lining Kailua Bay along the Kailua Pier. You need to arrive early to get a spot on the sea-wall which, gets pretty crowded, 3-deep on a 4′ section of the wall as the race start approaches. You’ll know the race is starting as more and more folks , many family and friends of age group athletes, start piling up on the wall. This is why watching the swim start is the least spectator friendly part of the race. Primarily because its an in-water start about 50 yards from the pier and everyone looks similar. If you want to watch from the wall , you need to get there EARLY (at least by 5:30am) and sit and reserve a spot, even then you’ll just see the back of the swimmers. If you’re looking for a photo of a friend of family before the start, it’s virtually impossible to spot a particular athlete because of the large mass start and difficulty picking out someone from about 50 yards away when everyone looks the same.. 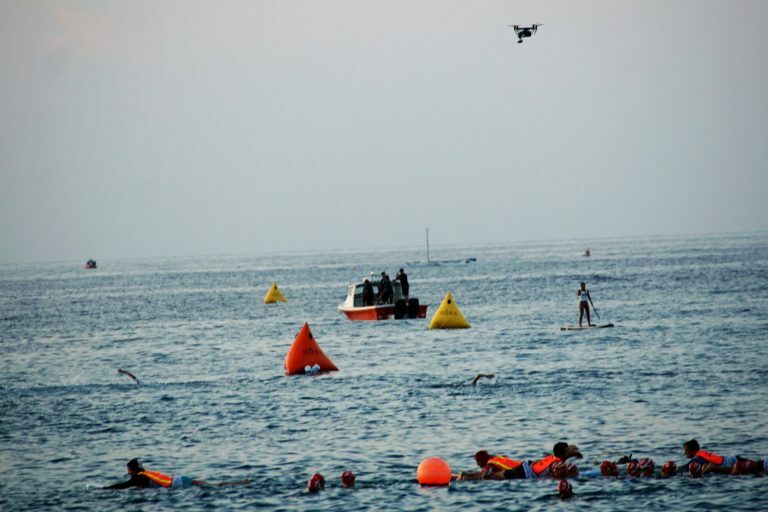 Tip: If you really want a swim start photo of a competitor you will need to coordinate ahead of time for them to line up next to a bouy or swim up to a part of the seawall right after the enter the water, there’s a small warm up window before the race begins. The age group mass start doesn’t look as impressive from the back, as it does from overhead as you typically see in the NBC footage. All you see is a big foam wave during first few seconds, then everyone starts to spread out. But nonetheless with all the helicopters buzzing overhead and the excitement of the crowd you’ll be able to soak in the start. Once the race is under way , you can also watch the pro race unfold on the big Jumbo-tron, positioned behind and above the finish line. So while you can’t see the entire 2.4 mile course you can catch the progress of the race just watching the screen near the finish, as well as listen to the announcer update you on the progress, or just grab your mobile phone and watch the same stream via Ironman.com/live site. 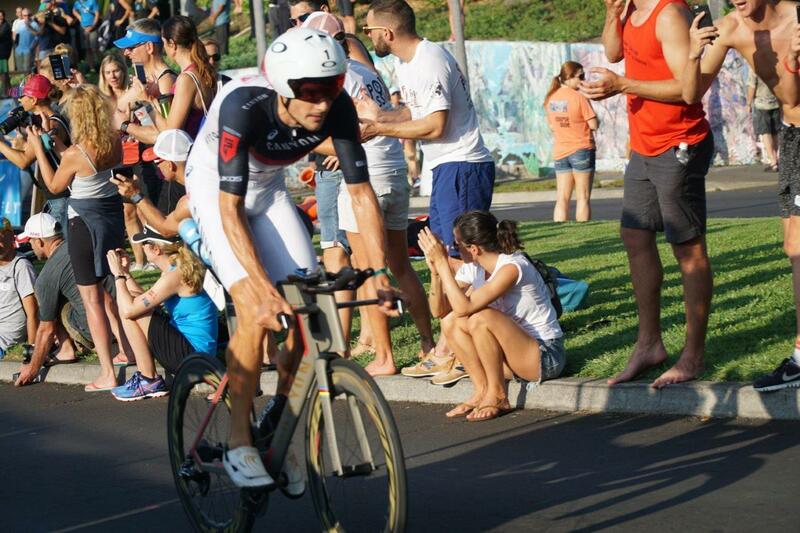 If you want to catch the pro’s early on the bike after the swim, begin making your way to the hot corner about 10-minutes before the lead men exit the water. The most spectator friendly area for the bike during the early bike miles is Pilani Drive right near and around the hot corner, this is a nice concentrated area, where you can catch cyclist 3 times. First as the athletes come barreling out of T1 towards the hot corner and turn left under the inflatable arch (Oakley sponsored this year) onto Kuakini Hwy. Within about 3-5 minutes they’re back , just turn around and and walk towards the hot corner then carefully (listen for whistle to warn of incoming riders), go onto the downside of Pilani just above hot corner, on the descent part of Pilani Drive where the cyclists come screaming down and turn left on to Kuakini Hwy. 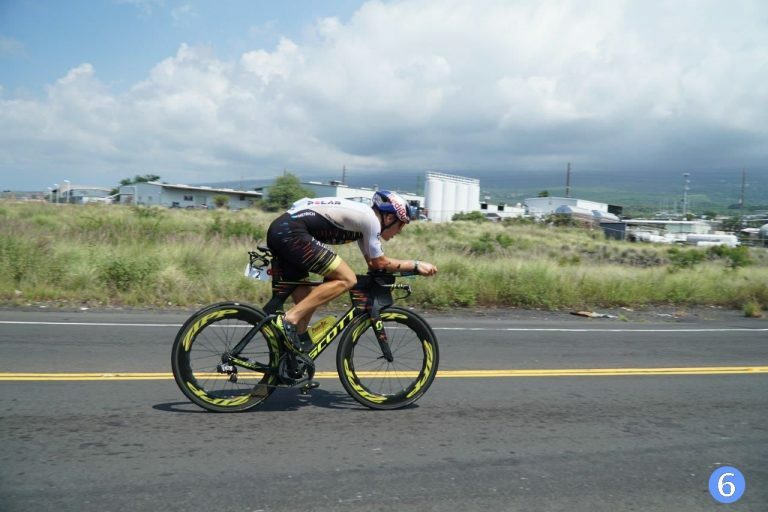 Within another 5-10 minutes they are back one more time, on the same road and cross to the other side the road and cheer the cyclists as they climb up Pilani road , as they head out to the Queen Ka’ahumanu highway (aka the Queen K highway) . They stay on this highway about 50+ miles all the way to the turn-around town of Hawi. It’s not practical to try and follow them out there since you’re talking about 100+ mile journey trying to keep up at 30mph. Now you have about 4 hours or so before the first of the pro men starting streaming back into T2. 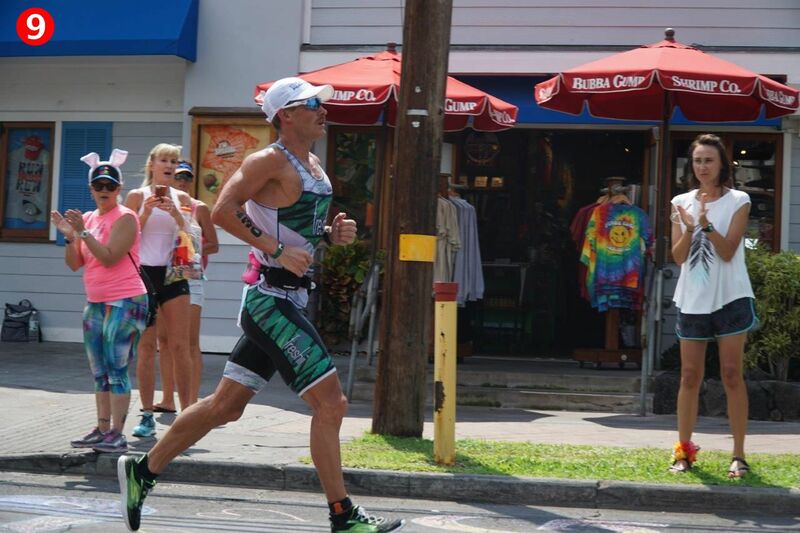 If you’re following an age grouper, check out the live Ironman Tracker and keep an eye out for their arrival. This is a good point to take a break during you day. If you’re really into photography more than just the area near transition, get yourself a bike (or a moped) and head out into portions of the Queen K. You can head down the Queen K which is mostly closed to vehicular traffic and catch some of the riders in the early miles or on the returning side as they head back into town. Another good spot for photos that doesn’t have too many folks , but it close enough to transition is a short half mile walk on Kuakini Hwy, just make a left at the hot corner and head down Kuakini a few hundred yards (across from the public pool) and sit under the shade of a few trees. Or you can just wait near the hot corner again (but it gets pretty crowded) and watch them come in. 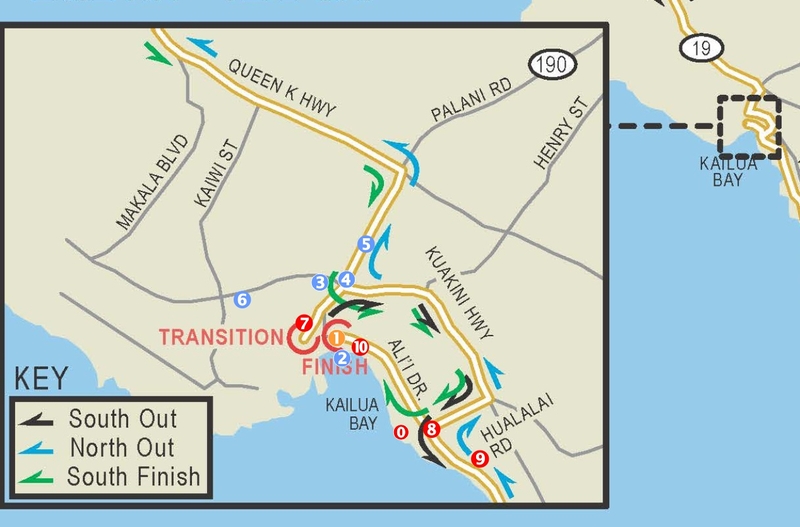 Depending on which athletes your most interested in following you can head back towards Kuakini Hwy past Pilani road and walk along the sidewalks as the athletes begin to stream out of T2, and onto Kuakini hwy for a short stint and then the turn right down Hualali to onto Ali Drive and head out to the turnaround in Keauhou. This will be about lunch time and plenty of folks will be lining Ali’i Drive , so you can take a few minutes to grab a bite and enjoy the action up-close (right on Ali’i drive) or from the comfort of the many eateries lining Ali’i drive..
It’s here on Ali’i drive where you can catch most of miles 1-10. And because of the turn-around you can easily catch a view of the athletes twice. If you’re feeling adventurous and really want to see the suffering grab your bike (moped) and head on out to the Energy lab turn around (about 8 miles) , during close races it’s usually during this section where moves are made. 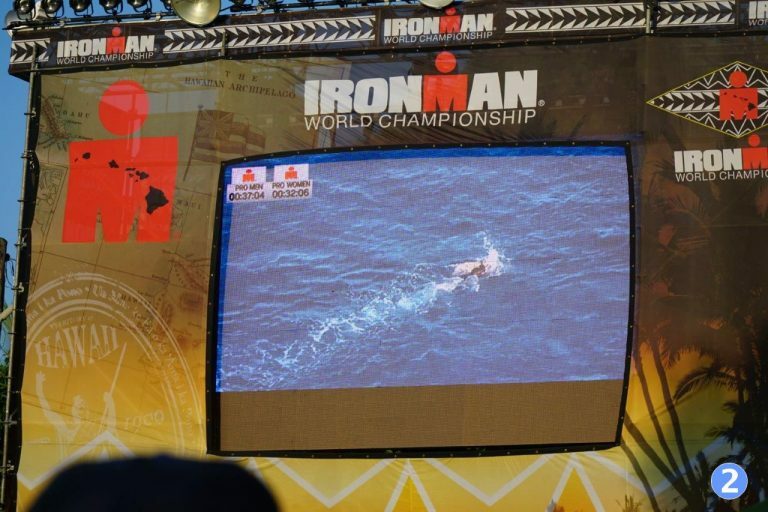 Of course you can just sit back on Ali ‘i Drive, viewing the race unfold on the Jumbo-tron, that’s what I did. Ironman 2017 – Patrick Lange men’s winner on Ali’i drive before finish chute. The best spot to watch the run finish up close is along Ali ‘i Drive near the finish line, there are stands there in front of the finish line , where you can sit, but all along Ali Drive near before the barricades and the finish chute, there are plenty of places to watch and cheer as the athletes make their way down Pilani and one final turn onto Ali ‘i Drive. You’ll know the race winner is approaching as you’ll hear the helicopter as well as see the race progress on the big screen. Pro men’s race is usually between 8:00 to 8:20 in length (This year the men’s winner Patrick Lange – set a new course record of 8:01 , thanks to mostly favorable bike conditions and a stellar 2:41 marathon run). than there’ about an hour plus before the first of the ladies comes down Ali’i drive. Again the big Jumbo-Tron is you’re friend just park your-self somewhere within sight of it , or of course you can stream the live action to you mobile device from http://www.ironman.com/live . Even if you just go to watch the pro’s or a family / friend compete and they finish in the late afternoon, make it a point to come back for the closing hours of the race. Starting around 10:30pm, as the last of the athletes make their way to the finish, excitement builds thanks to a literal finish line party. Race organizer start the party with plenty of pop and dance music coupled with give away plus Mike Riley (voice of Ironman and others) encourage the crowd to bring home those last few finishers before the 17hr cut-off. 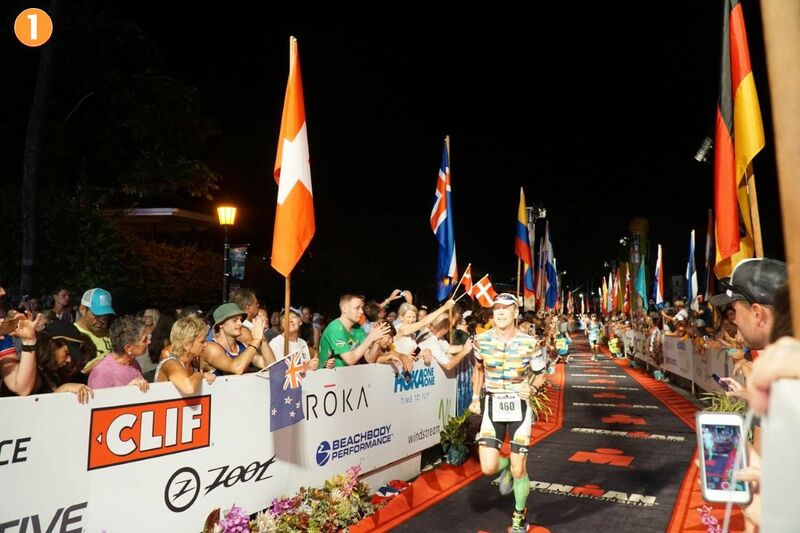 As it has become Ironman tradition the day’s men’s and women’s pro winners return back to the finish line to greet the last of the finishers and give them their medals, its really an emotion packed finish line. From the cheering crowd, the announcers rallying up the crowd, the music the joy ,excitement and release of emotion by the finishers from the days extreme exhaustion, I can see why this sport can become cult-like in a good sort of way.. While I was there to spectate and see the pro’s , it turned out for me the closing hours were the highlight of the event, definitely a must see, it will give you a new perspective on the human spirit. 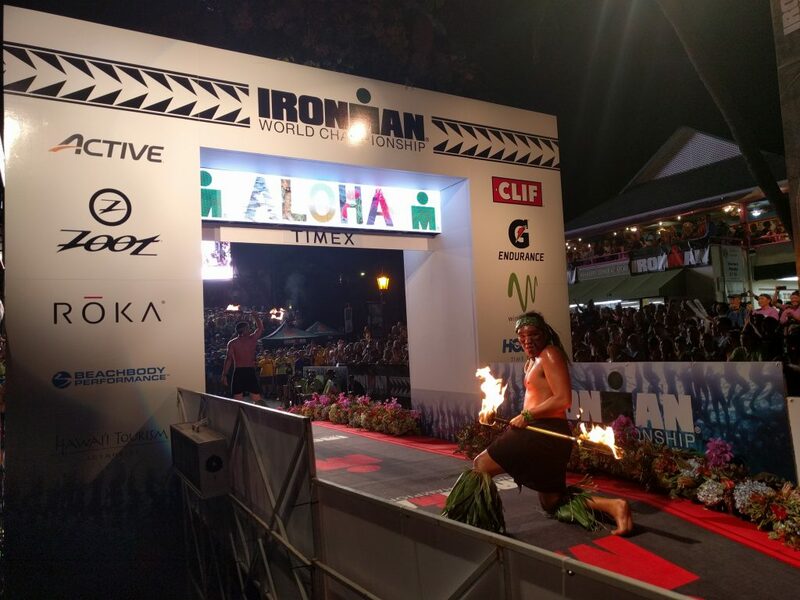 When the final 17:00h cut-off for the last age group wave ends sometime shortly past midnight, the music subsides, and a traditional Hawaiian fire dance (closing ceremony) right on the finish line plus a goodwill speech by an island elder in ? ?lelo Hawai?i , the native Hawaiian language, closes out the evening. Any athletes still on the course can cross the finish but missing the cut-off, will not be recognized as official Ironman finishers.. Photographic Gear, Cameras and Drones…. If you’re into photography and want to really capture the days events, you’re best best is to bring a DSLR or high-end mirror less camera with a fast lens. Like any sporting event, the action is fast (especially on the bike), so a nice fast lens like an f/2.8 is nice to have, but thanks to predictably sunny weather you can get away with slower zoom lens. Also consider an ND-filter as much of the pro’s race takes place during middle of the day, when the sun casts some harsh light. Most of the photos on this page where taken with a Sony a6000 & a G18mm-105mm f/4 lens. I also snapped a few quick photos of with my smart phone (mostly during the evening finish line), So between a good quality smartphone and decent DSLR or a mirror-less camera with good lenses, you should have plenty of photographic firepower to catch the days events. Also don’t forget to bring a few extra batteries or chargers, its along day, and I went through two full-charged batteries on my Sony before the end of the day..
Can I bring my drone? this is an interesting question, I surprising saw quite a few drones (DJI inspire’s, mavic’s buzzing around) right over the water during the start. I’m not sure, but I suspect with all the helicopter traffic (three of them at race start, plus one that follows the lead athletes most of the day) in the area, you’re most certainty violating FAA rules by flying drones in close proximity to other aircraft. Use sound judgement, and abide by FAA rules not to fly over people or with aircraft in the area. I would recommend you save your drone footage for the week before the race. Wear your usual casual clothes, but cargo shorts with pockets and a backpack (if you’re bringing photo gear) is a must. Other than that perhaps just a water bottle or cash will suit you just fine. Do plan some breaks through the morning especially after about 9:30 when its mostly quiet while the majority of pro’s and age groupers are out on the bike course. Between noon and 1pm , is a good time to grab a bit plus its a perfect time to watch the leading runner on Ali’i drive. Then if you’re there to wait for family or friends, the time between 4pm and 8pm is when the bulk of the finishers come across the line. 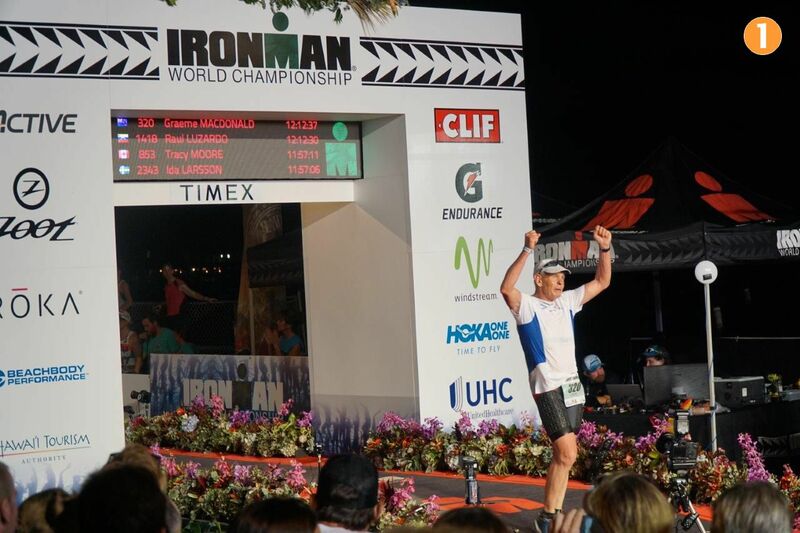 The Official Ironman Tracker App is the best tool to determine where they may be on the course. There’s plenty of places to eat in and around Ali’i drive for dinner too. if you come back later in the evening you’ll have no problems finding some grub.. It’s funny how jus ta few blocks from the finish its just another busy Saturday night with people going about their business.. If you’re not necessarily there just for photos or cheering and want to contribute to everyone’s experience consider volunteering and being part of the race. 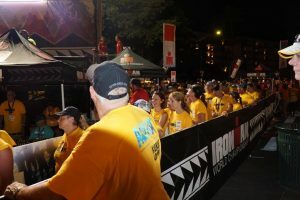 There are various volunteer shifts for all sorts of activities, finish line, transition, medical, security etc, head over to the volunteer application section of Ironman’s web site. Overall watching the big race live in person that you see on TV , you won’t be disappointed. 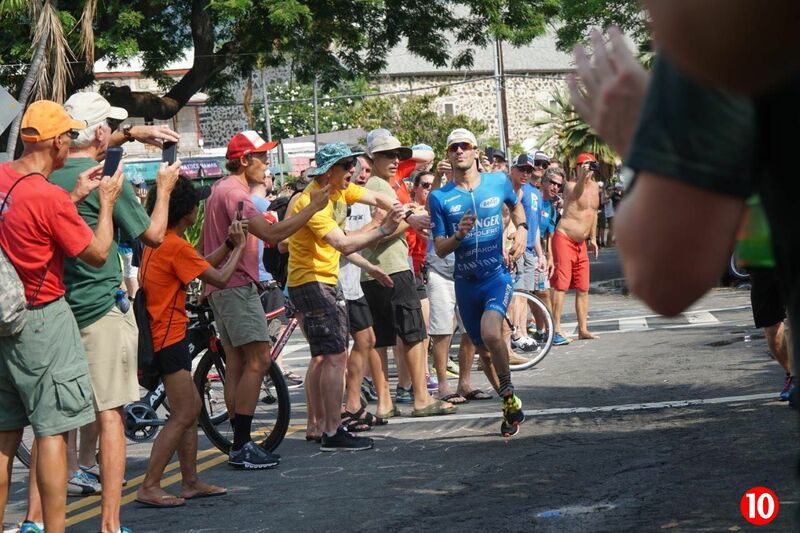 There’s a lot of emotion and excitement as most of the crowd there knows someone taking part or is an avid fan of the sport, so if you’re into triathlon come see what for yourself what the big show is like! if you found this guide useful let me know, and share any new insights with fellow spectators. Is there seating near the finish? Yes, there is . On race day they put down aluminum bleachers on both sides of the finishing straight, near the finish line and you can go there,there’s no tickets or anything and usually there’s space during the day, in the late afternoon as the bulk of the athletes finish it gets most crowded as family/friends wait there.. 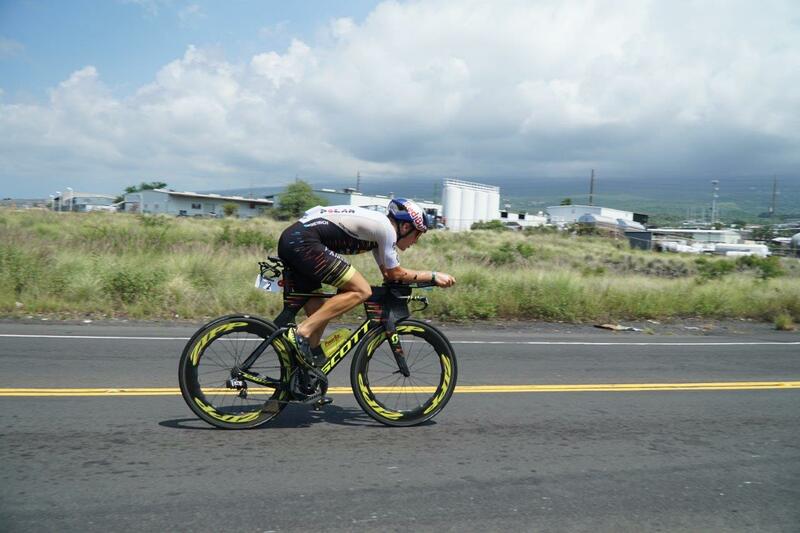 I thought Kona-Ironman day was nofly zone for drones? I hear they have an underpants run before is that right? Where can I park? I didn’t see you discuss anything about parking. See above I added some more information about potential parking spots.